In an earlier post (Sept. 18), I wrote that learning about connectivism has made me rethink how I ask students to respond to literature and participate outside of class. 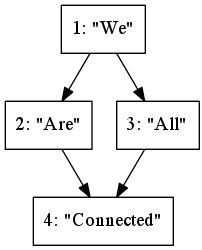 To review, the guiding principles in a connectivist class are “that each person creates their own perspective on the material by selecting what seems important to them, and that it is these different perspectives that form the basis for the interesting conversations and activities that follow” (Downes, 2011). In addition to learning about connectivism, I experienced this approach to learning as a student this semester. One of my graduate classes required students to create our own methods of participating outside of class; we could create a blog, contribute to the course’s Twitter hashtag, or find another way to interact with our classmates online. All of the separate contributions were then aggregated onto the course’s website. For my participation, I checked the Twitter hashtag often, tweeted about relevant articles occasionally, and most importantly, started this blog. To summarize my thoughts about connectivism, I have created a short video using Powtoon, which is a great resource that enables teachers to create short animated videos. It is very easy to use, especially if you choose to modify an existing template, as I did for my video. I learned about this website from some of my classmates’ blogs. This is one great benefit of connectivism: it encourages people to share ideas and resources and learn from their peers. Thank you to my classmates for introducing me to this resource! To learn more about my reflections on connectivism, please enjoy the video below. I agree completely! I really see the power in connectivism and am excited to bring more of these ideas to my classroom. Also, once again, great work on your guys’ project! I really think it is an excellent tool! Thank you so much, Bobbi!